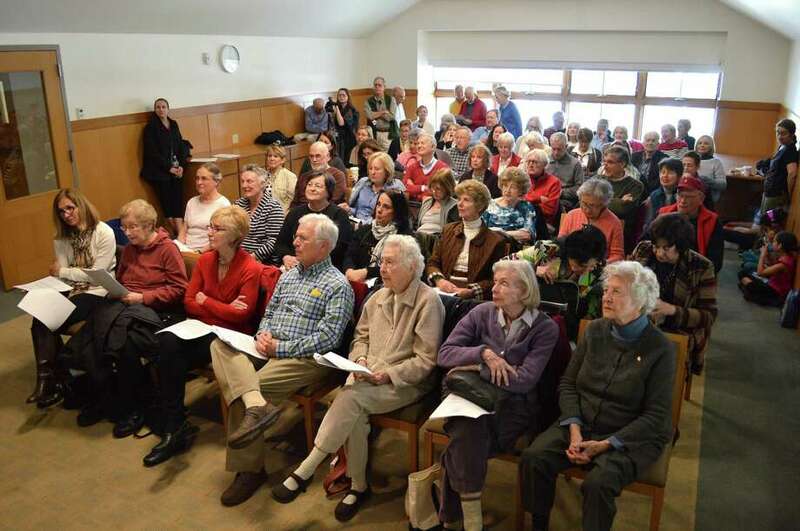 It was a full house at Darien Library Monday afternoon for the first in a four-part series on Islam. DARIEN — Concerns about terrorism and unrest in the Middle East were reflected by the large turnout for the first in a four-part talk on Islam and Jihad. “I want to learn more … because of what’s going on in the world today,” said Jeanne Schifini of Darien. She and close to 50 others packed a room at Darien Library on Monday afternoon to hear Mark Albertson, a history teacher at Norwalk Community College, talk about a religion that is still a mystery to many in the U.S.
“I don’t think many Americans really understand the situation, as well as understand the Islam religion,” said Albertson, who believes many of the problems there are directly tied to the root causes of World War I. This is because the national boundaries in the region were drawn by Europeans who did not live there, and did not have any understanding of the traditional alliances, groups and tribes in existence. Consequently, these were haphazardly divided and, inadvertently, aligned by country borders, resulting in an ongoing state of unrest. Further, he said, the true meanings of the practice of Islam, which tie directly to the region, need to be understood in order for this country to create intelligent policy. “We’re not brought up there, so many Americans don’t understand this,” said Albertson, who is also a historical research editor with Army Aviation magazine, and a member of the United States Naval Institute. He said that particularly in an election year, it’s important to elect people who understand the differences when they begin drafting policy, rather than choosing a candidate who simply advocates “carpet-bombing” the whole area. Albertson began with the story of Muhammad ibn Abdallah, later known as the Prophet Muhammad, and highlighted how his religious message, which was not too dissimilar in its roots from Christianity or Judaism, led to massive conversions. Upon his death, however, as with disparate sects in other religious, dogmatic rifts between believers ultimately led to great discord. “I’ve always been interested in the subject,” said Joanne Croteau of Darien, who believes the Muslim community itself needs to play the pivotal role in solving the unrest. “There’s so much stigma attached now to the whole Muslim issue that I think people need to be educated,” said Arlene Tulacro of Darien. The program will run for the next three Mondays and is free. For more information visit the darienlibrary.org.